drag-action-ask The places sidebar emits this signal when it needs to ask the application to pop up a menu to ask the user for which drag action to perform. drag-action-requested When the user starts a drag-and-drop operation and the sidebar needs to ask the application for which drag action to perform, then the sidebar will emit this signal. drag-perform-drop The places sidebar emits this signal when the user completes a drag-and-drop operation and one of the sidebar’s items is the destination. mount The places sidebar emits this signal when it starts a new operation because the user clicked on some location that needs mounting. open-location The places sidebar emits this signal when the user selects a location in it. populate-popup The places sidebar emits this signal when the user invokes a contextual popup on one of its items. show-enter-location The places sidebar emits this signal when it needs the calling application to present an way to directly enter a location. show-error-message The places sidebar emits this signal when it needs the calling application to present an error message. show-other-locations-with-flags The places sidebar emits this signal when it needs the calling application to present a way to show other locations e.g. show-starred-location The places sidebar emits this signal when it needs the calling application to present a way to show the starred files. unmount The places sidebar emits this signal when it starts a new operation because the user for example ejected some drive or unmounted a mount. Gtk.PlacesSidebar is a widget that displays a list of frequently-used places in the file system: the user’s home directory, the user’s bookmarks, and volumes and drives. 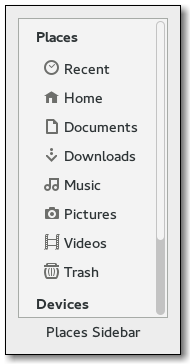 This widget is used as a sidebar in Gtk.FileChooser and may be used by file managers and similar programs. While bookmarks are completely in control of the user, the places sidebar also allows individual applications to provide extra shortcut folders that are unique to each application. For example, a Paint program may want to add a shortcut for a Clipart folder. You can do this with Gtk.PlacesSidebar.add_shortcut(). To make use of the places sidebar, an application at least needs to connect to the Gtk.PlacesSidebar ::open-location signal. This is emitted when the user selects in the sidebar a location to open. The application should also call Gtk.PlacesSidebar.set_location() when it changes the currently-viewed location. Gtk.PlacesSidebar uses a single CSS node with name placessidebar and style class .sidebar. Creates a new Gtk.PlacesSidebar widget. The application should connect to at least the Gtk.PlacesSidebar ::open-location signal to be notified when the user makes a selection in the sidebar. Returns the value previously set with Gtk.PlacesSidebar.set_local_only(). a Gio.File with the selected location, or None if nothing is visually selected. Gets the currently selected location in the self . This can be None when nothing is selected, for example, when Gtk.PlacesSidebar.set_location() has been called with a location that is not among the sidebar’s list of places to show. You can use this function to get the selection in the self . Also, if you connect to the Gtk.PlacesSidebar ::populate-popup signal, you can use this function to get the location that is being referred to during the callbacks for your menu items. The bookmark specified by the index n , or None if no such index exist. Note that the indices start at 0, even though the file chooser starts them with the keyboard shortcut “Alt-1”. This function queries the bookmarks added by the user to the places sidebar, and returns one of them. This function is used by Gtk.FileChooser to implement the “Alt-1”, “Alt-2”, etc. shortcuts, which activate the cooresponding bookmark. True if the sidebar will display a Starred item. Removes an application-specific shortcut that has been previously been inserted with Gtk.PlacesSidebar.add_shortcut(). If the location is not a shortcut in the sidebar, then nothing is done. visible (bool) – whether to show the valid targets or not. context (Gdk.DragContext) – drag context used to ask the source about the action that wants to perform, so hints are more accurate. Make the Gtk.PlacesSidebar show drop targets, so it can show the available drop targets and a “new bookmark” row. This improves the Drag-and-Drop experience of the user and allows applications to show all available drop targets at once. This needs to be called when the application is aware of an ongoing drag that might target the sidebar. The drop-targets-visible state will be unset automatically if the drag finishes in the Gtk.PlacesSidebar. You only need to unset the state when the drag ends on some other widget on your application. Sets whether the self should only show local files. Sets the location that is being shown in the widgets surrounding the self , for example, in a folder view in a file manager. In turn, the self will highlight that location if it is being shown in the list of places, or it will unhighlight everything if the location is not among the places in the list. This function is used to tell the places self about the ways in which the application can open new locations, so that the sidebar can display (or not) the “Open in new tab” and “Open in new window” menu items as appropriate. When the Gtk.PlacesSidebar ::open-location signal is emitted, its flags argument will be set to one of the flags that was passed in Gtk.PlacesSidebar.set_open_flags(). Passing 0 for flags will cause Gtk.PlacesOpenFlags.NORMAL to always be sent to callbacks for the “open-location” signal. Sets whether the self should show an item for connecting to a network server; this is off by default. An application may want to turn this on if it implements a way for the user to connect to network servers directly. If you enable this, you should connect to the Gtk.PlacesSidebar ::show-connect-to-server signal. Sets whether the self should show an item for the Desktop folder. The default value for this option is determined by the desktop environment and the user’s configuration, but this function can be used to override it on a per-application basis. Sets whether the self should show an item for entering a location; this is off by default. An application may want to turn this on if manually entering URLs is an expected user action. If you enable this, you should connect to the Gtk.PlacesSidebar ::show-enter-location signal. Sets whether the self should show an item for the application to show an Other Locations view; this is off by default. When set to True, persistent devices such as hard drives are hidden, otherwise they are shown in the sidebar. An application may want to turn this on if it implements a way for the user to see and interact with drives and network servers directly. If you enable this, you should connect to the Gtk.PlacesSidebar ::show-other-locations signal. Sets whether the self should show an item for recent files. The default value for this option is determined by the desktop environment, but this function can be used to override it on a per-application basis. If you enable this, you should connect to the Gtk.PlacesSidebar ::show-starred-location signal. Sets whether the self should show an item for the Trash location. actions (int) – Possible drag actions that need to be asked for. The drag action to use, for example, Gdk.DragAction.COPY or Gdk.DragAction.MOVE, or 0 if no action is allowed here (i.e. drops are not allowed in the specified dest_file ). dest_file (Gio.File) – Destination Gio.File. source_file_list ([Gio.File]) – GLib.List of Gio.File that got dropped. action (int) – Drop action to perform. The places sidebar emits this signal when the user completes a drag-and-drop operation and one of the sidebar’s items is the destination. This item is in the dest_file , and the source_file_list has the list of files that are dropped into it and which should be copied/moved/etc. based on the specified action . mount_operation (Gio.MountOperation) – the Gio.MountOperation that is going to start. The places sidebar emits this signal when it starts a new operation because the user clicked on some location that needs mounting. In this way the application using the Gtk.PlacesSidebar can track the progress of the operation and, for example, show a notification. location (Gio.File) – Gio.File to which the caller should switch. open_flags (Gtk.PlacesOpenFlags) – a single value from Gtk.PlacesOpenFlags specifying how the location should be opened. selected_item (Gio.File or None) – Gio.File with the item to which the popup should refer, or None in the case of a selected_volume . selected_volume (Gio.Volume or None) – Gio.Volume if the selected item is a volume, or None if it is a file. The places sidebar emits this signal when the user invokes a contextual popup on one of its items. In the signal handler, the application may add extra items to the menu as appropriate. For example, a file manager may want to add a “Properties” command to the menu. It is not necessary to store the selected_item for each menu item; during their callbacks, the application can use Gtk.PlacesSidebar.get_location() to get the file to which the item refers. The selected_item argument may be None in case the selection refers to a volume. In this case, selected_volume will be non-None. In this case, the calling application will have to GObject.Object.ref() the selected_volume and keep it around to use it in the callback. Before 3.18, the container always was a Gtk.Menu, and you were expected to add your items as Gtk.MenuItems. Since 3.18, the popup may be implemented as a Gtk.Popover, in which case container will be something else, e.g. a Gtk.Box, to which you may add Gtk.ModelButtons or other widgets, such as #GtkEntries, Gtk.SpinButtons, etc. If your application can deal with this situation, you can set Gtk.PlacesSidebar ::populate-all to True to request that this signal is emitted for populating popovers as well. The places sidebar emits this signal when it needs the calling application to present an way to connect directly to a network server. For example, the application may bring up a dialog box asking for a URL like “sftp://ftp.example.com”. It is up to the application to create the corresponding mount by using, for example, Gio.File.mount_enclosing_volume(). Deprecated since version 3.18: use the Gtk.PlacesSidebar ::show-other-locations signal to connect to network servers. The places sidebar emits this signal when it needs the calling application to present an way to directly enter a location. For example, the application may bring up a dialog box asking for a URL like “http://http.example.com”. primary (str) – primary message with a summary of the error to show. secondary (str) – secondary message with details of the error to show. open_flags (Gtk.PlacesOpenFlags) – a single value from Gtk.PlacesOpenFlags specifying how it should be opened. open_flags (Gtk.PlacesOpenFlags) – a single value from Gtk.PlacesOpenFlags specifying how the starred file should be opened. The places sidebar emits this signal when it starts a new operation because the user for example ejected some drive or unmounted a mount. In this way the application using the Gtk.PlacesSidebar can track the progress of the operation and, for example, show a notification. If :populate-all is True, the Gtk.PlacesSidebar ::populate-popup signal is also emitted for popovers.